Brazilian Rainbow Boas are so named due to their beautiful multicolored iridescent sheen that appears over areas of their body when exposed to certain lighting. They are native to South America but the vast majority seen today in the states are captive bred. 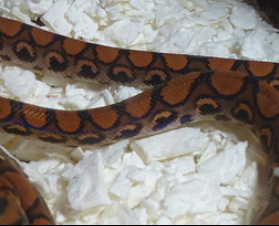 The Brazilian Rainbow Boa , or BRB, is most often seen as a dull brick red to orange colored animal, with bold black outlined circles running down the dorsal line, or back. Along their sides, they have “eyes” that run down their entire length. As when purchasing any animal, be aware of the size of the housing it will require as a full grown adult. A BRB will grow from eighteen inches as baby, to full adult size averaging around six feet, with some reaching seven feet. Size varies between males and females, with the females usually being longer. They are a slender snake, so as an adult, they do not have the girth and bulk of some of the other more common boas. Housing will depend on the size and age of the animal. Even though the BRB is a ground dwelling animal, a larger habitat with branches and ledges will give them plenty of room to exercise in, and to show off their beautiful body patterns. With the choice of housing, humidity needs to be taken into consideration. Brazilian Rainbow Boas can dehydrate rather easily and need a stable humid environment that never drops below 50% for any period of time. A habitat with a screen top, such as a fish tank, will need to have the majority of the screen covered with tinfoil, or some other covering, to keep the interior a consistent level of 80%. Also, a humid hide box, which can be bought or made from a plastic food storage type box, should be provided and kept moist inside, with a humidity level of 90-100%. Various substrates that can be used with BRBs, run the gamut. Coco Soft, sphagnum moss and Repti Bark are all great for helping with humidity. Also, for ease of cleaning, paper towels and clean newspaper work also but careful attention will be needed to make sure humidity levels are maintained correctly. As an aid in keeping the habitat humid enough, large crock style water bowls, or any container deep enough with a wide surface area, will help with moisture levels and also provide a big enough container for the animals to take long leisurely soaks, which they do often. Keeping proper humidity, and a proper sized water pan or bowl, will also help the animal deal with shedding and reduce the potential of improper and stuck body sheds and eye caps. Ours like to soak often, so frequent washing and disinfecting of their bowls, and fresh water, is needed. The habitat will also need to be misted on a regular basis. Using a hygrometer with your set up is the smartest way to make sure that the proper environment is being maintained for the well-being of the animal. Due the humidity requirements of this species, it is imperative to constantly monitor the substrate and hides for any signs of mold or mildew which can sicken and kill the animal. Temperatures for the interior of the habitat for a Brazilian Rainbow Boa tend to be cooler than those of other boas and pythons. One end of the cage, tank or bin can be heated with an UTH , applied to either the side or bottom of the enclosure, or, with an incandescent bulb on the exposed screen area of a tank lid. Remember, with a screen lid, three quarters of it will be covered with tinfoil, plexi glass or some other material, to help stabilize the 80% humidity that is needed. A comfortable heat gradient for a BRB should range from 70-74*F on the cool end of the cage, to no higher than 90*F on the warm end. In our home, during the spring and very early summer, we have our windows open. Living in the south, it can be very cool during the morning and late evening, to extremely hot in the afternoon. I have seen our BRBs become very restless, and watch as they move about their cages in search of a cooler area. They do NOT like to be very warm, and temperatures should always be monitored to reduce stress to them. Brazilian Rainbow Boas have a rainbow iridesence which is a gorgeous sheen all over their body. Baby or very young BRBs will need feeding once a week, while adults can be fed every ten days to two weeks. We prefer feeding frozen thawed rat pinks or rats, versus feeding live. The food being offered should never be larger in diameter than the widest part of the snake. A feeder that is a bit smaller than the girth of the snake’s body is preferable. Feeding live rodents to snakes always poses the risk of severe injury to the snake, from punctures to the body, skull,head,nose and eyes. If a snake is not yet adapted to eating frozen thawed food, and feeding live feeders is a necessity, never ever leave a rodent in an enclosure with a snake overnight. It is best, when feeding live prey, to supervise the snakes and the feeders to make sure no harm comes to the snake. Some feeders have the potential to be extremely aggressive, and are capable of causing serious injury that can result in death of the snake. Brazilian Rainbow Boas are easily one of the most beautiful snakes on the reptile companion pet list. With proper care and diet, a BRB has the potential to live up to twenty years. As youngsters, they tend to be a bit hyper, and can also be a little nippy. Consistent and frequent gentle handling, in a calm environment, easily remedies this and as adults they provide their owners with countless hours of enjoyment and an extremely beautiful and wonderful companion.